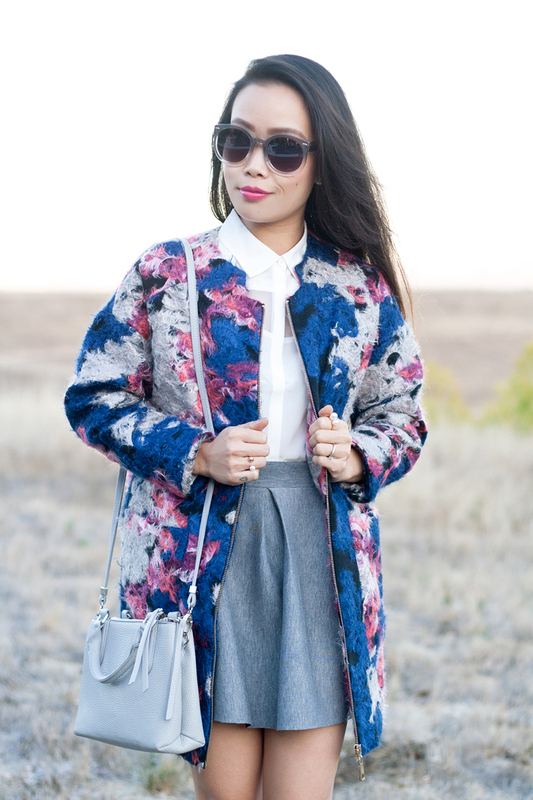 If you have been following me for awhile, you would know that my style is anything but dark. 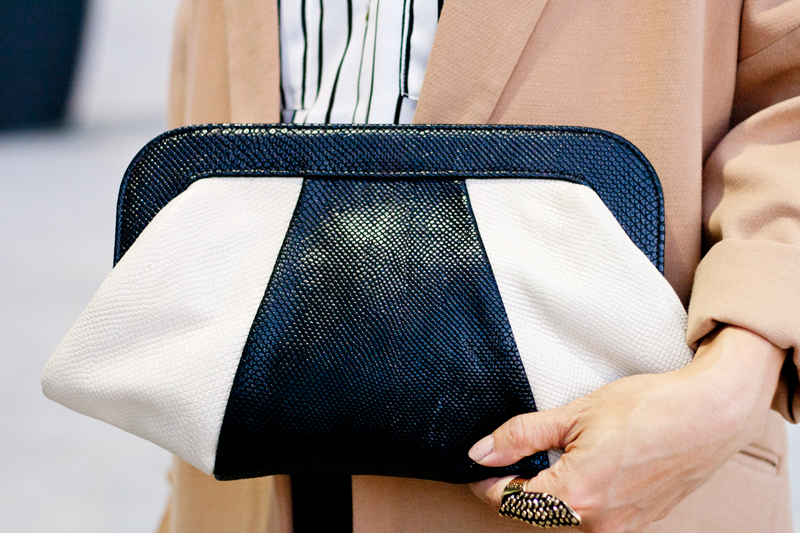 Whether it be fashion or home decor, I tend to gravitate toward the lighter and brighter end of the spectrum. With that said, it is no surprise that my Halloween decor is just the same. In fact, I see myself displaying these pieces all year round! This little dish from Lavinia's Tea Party is perfect for holding trinkets (you can use it for whatever really). 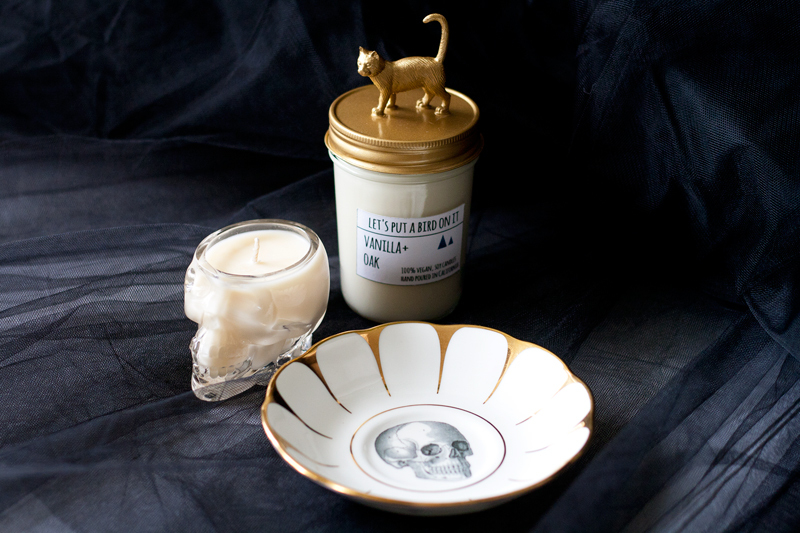 The best part is that it is actually a gold and off-white vintage china made in England revamped with a skull. How awesome is that? 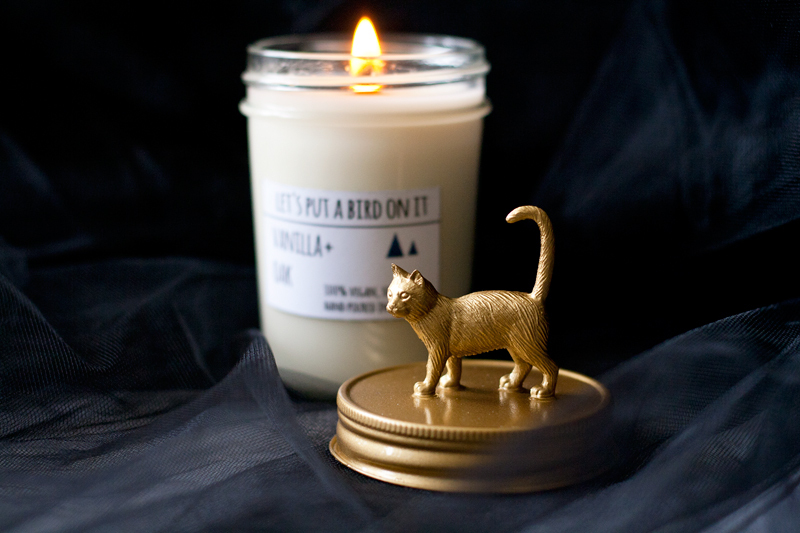 And these candles from Let's Put a Bird On It... they look AND smell SO good! 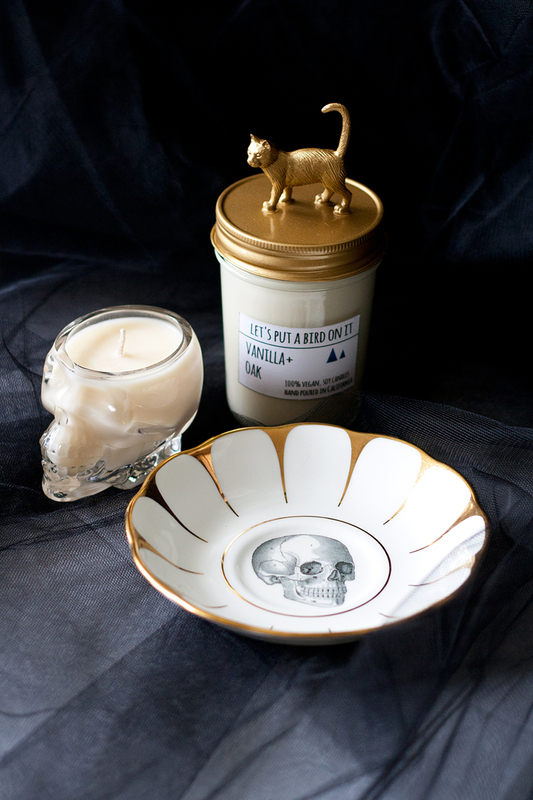 The one with the gold cat is vanilla and oak and the glass skull is apricot and fig. Not only do these hand poured soy candles look great, they also go to a great cause too (10% of all proceeds go to Humane Society)! Happy Halloween everyone! 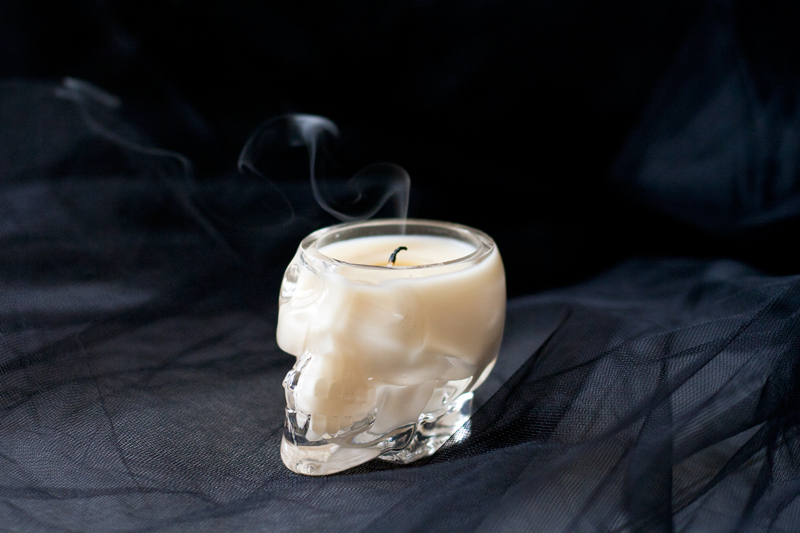 Glass skull candle c/o Let's Put a Bird On It. 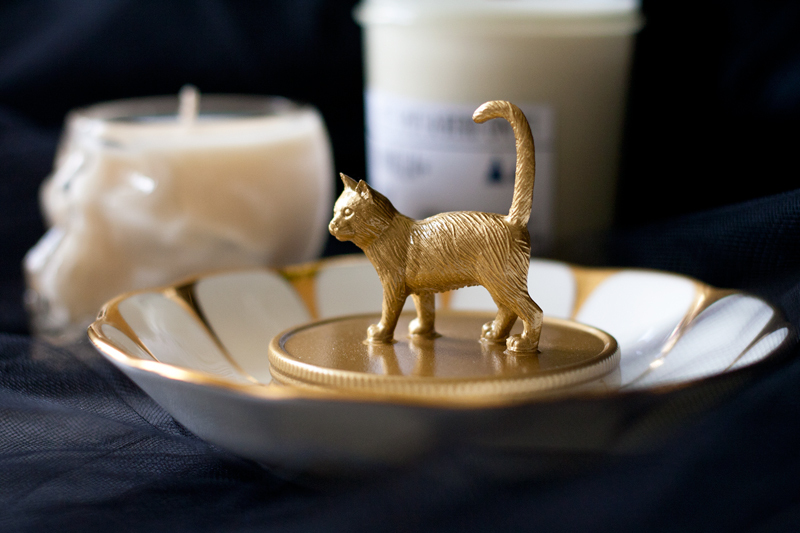 Gold cat jar candle c/o Let's Put a Bird On It. 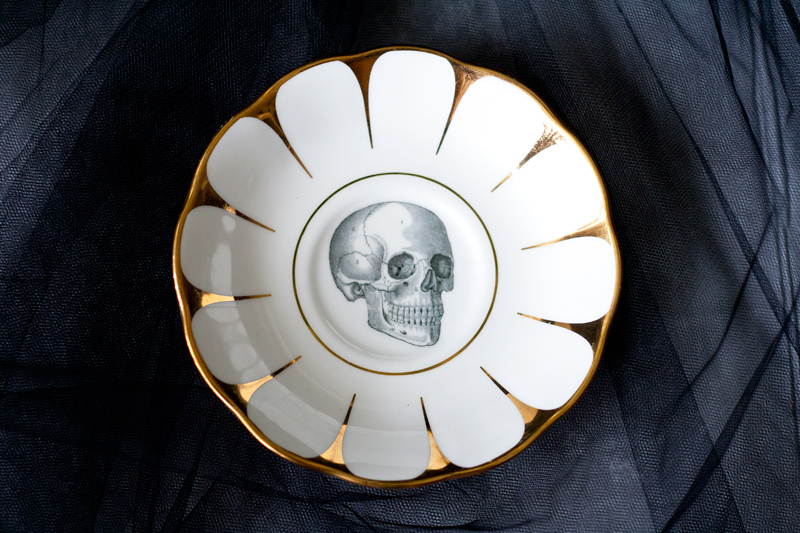 Gold and off-white vintage china skull dish c/o Lavinia's Tea Party. Joke's on me... as soon as we went outside it started pouring! I guess there is always a first for everything, shooting in the rain that is. I can't decide whether I like or hate the little specks of raindrops in the photos but at least my outfit was rain appropriate (kind of). Cape! Cape! 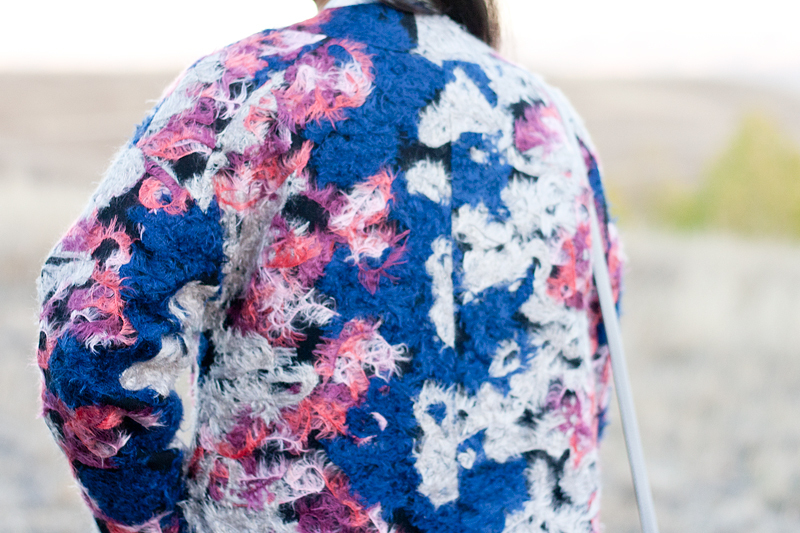 Cape! 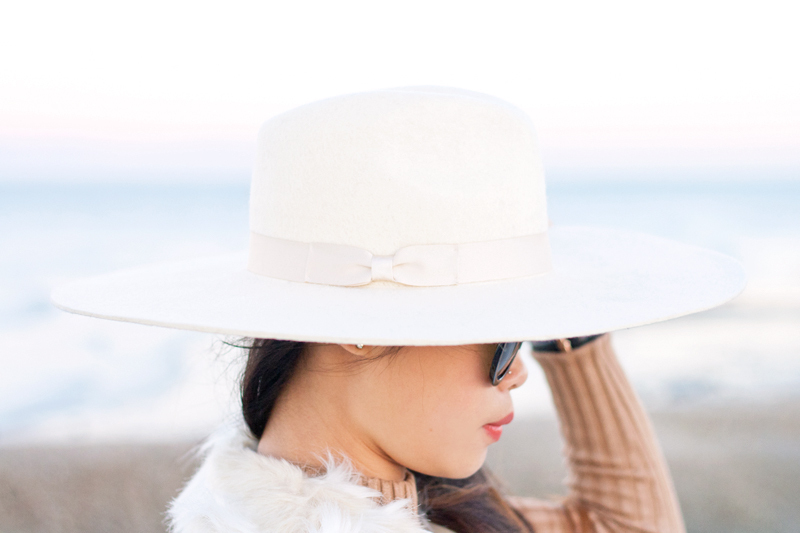 My love for cape is quite strong and I guarantee that you will be seeing lots of cape style on here this coming season! 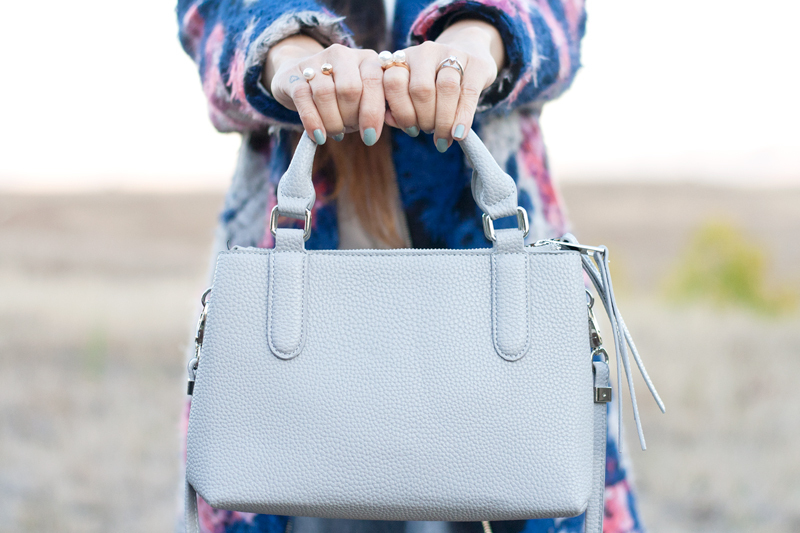 It's timeless, classy, and most importantly comfy. 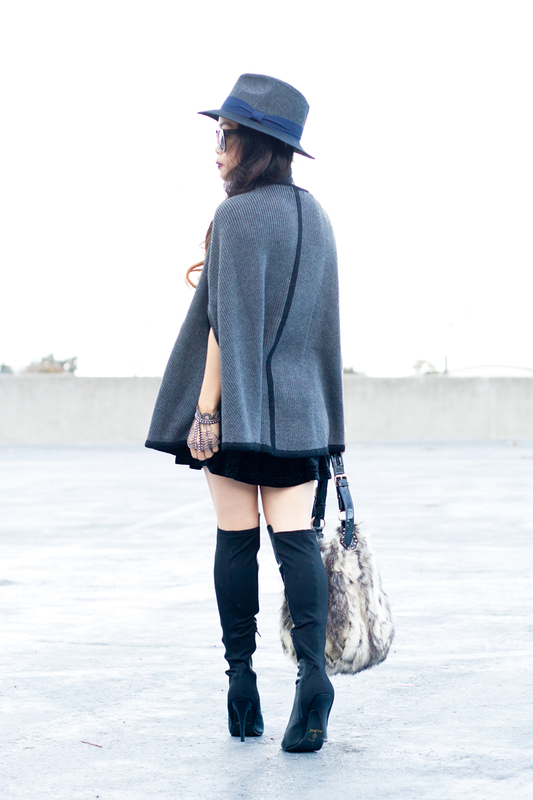 This particular charcoal ribbed knit cape with black trim is from F21, I paired it with a fedora hat, over-the-knee boots, and a fur bag. But let me steer your attention to my left hand... 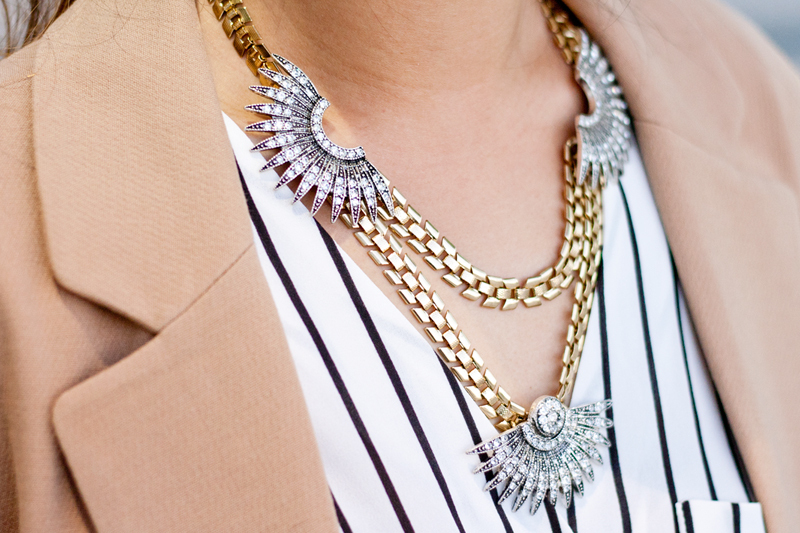 I am wearing the most incredible and most intricate piece of jewelry I have ever owned! This Coltrane microphone glove by Lionette, made of Swarovski crystals and pearls, might just be the best thing ever! Just look at it! Need I say more? 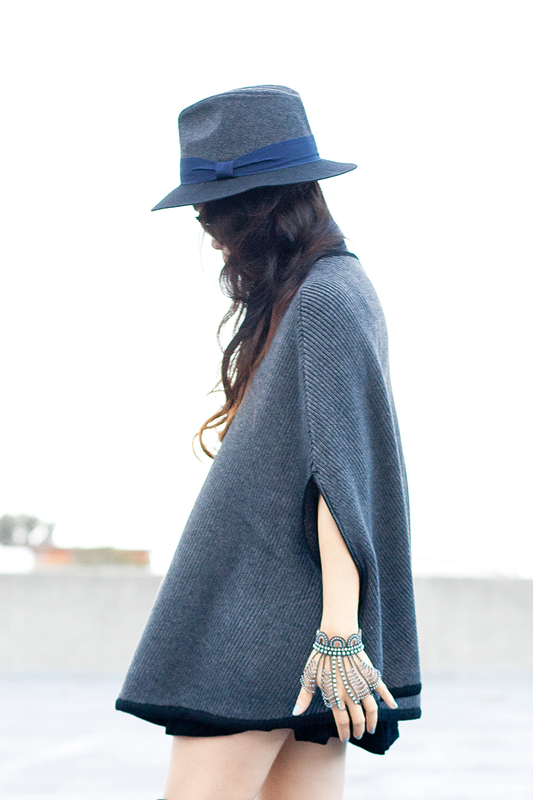 Ribbed knit cape c/o F21. 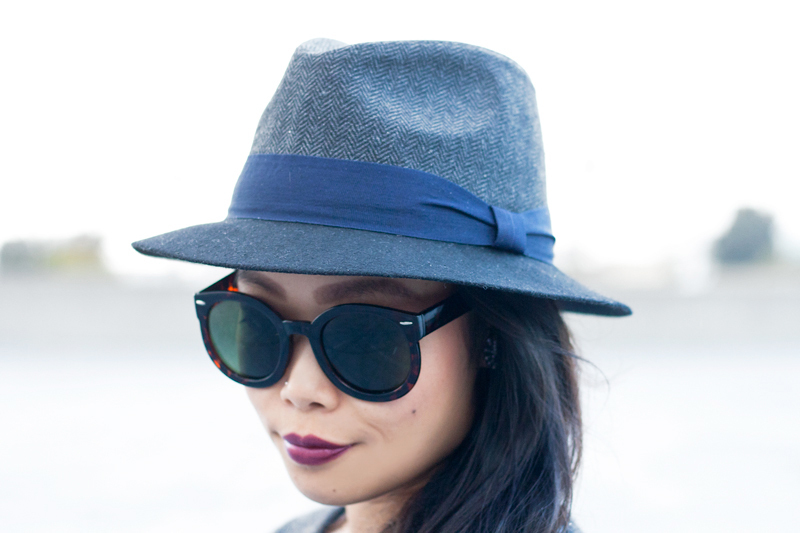 Herringbone fedora hat c/o Prima Donna. Coltrane microphone glove c/o Lionette. 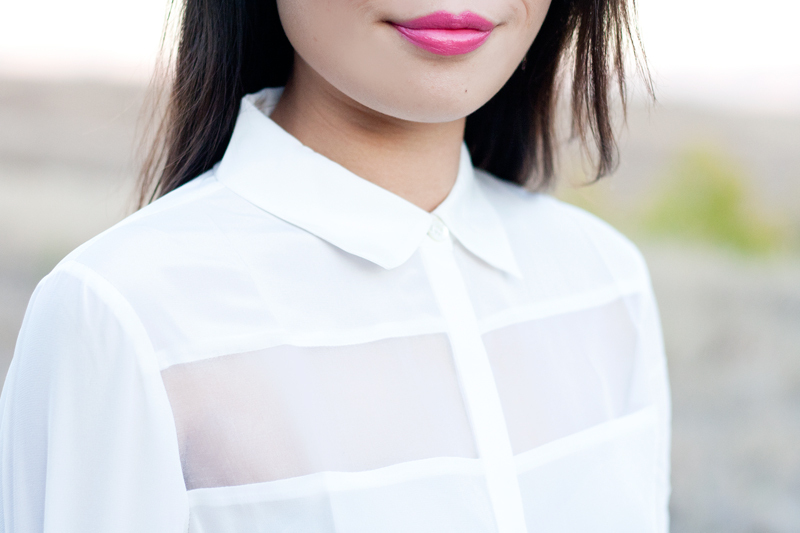 Ribbed high-neck sweater c/o F21. 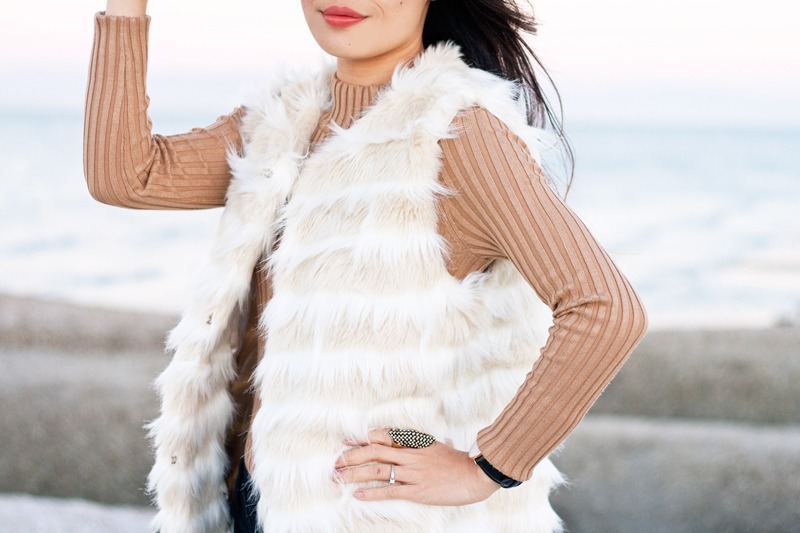 Striped faux fur vest c/o F21. 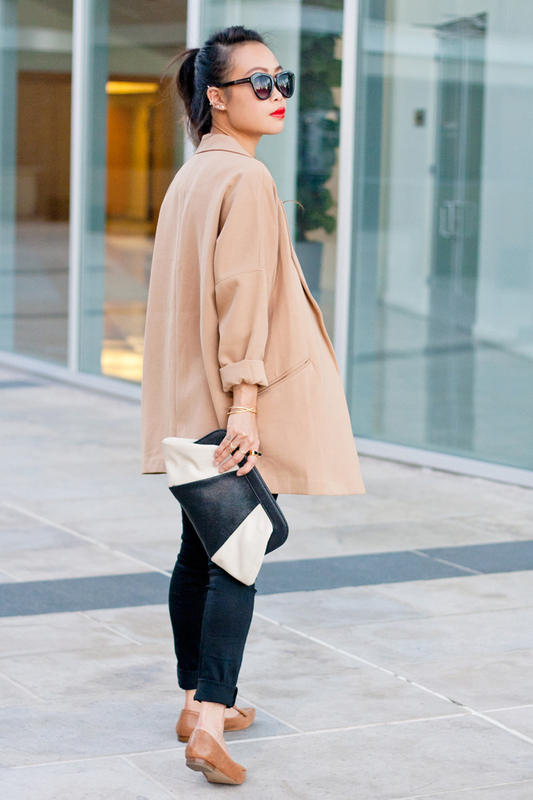 Zip it Emy leather boots c/o Swedish Hasbeens. 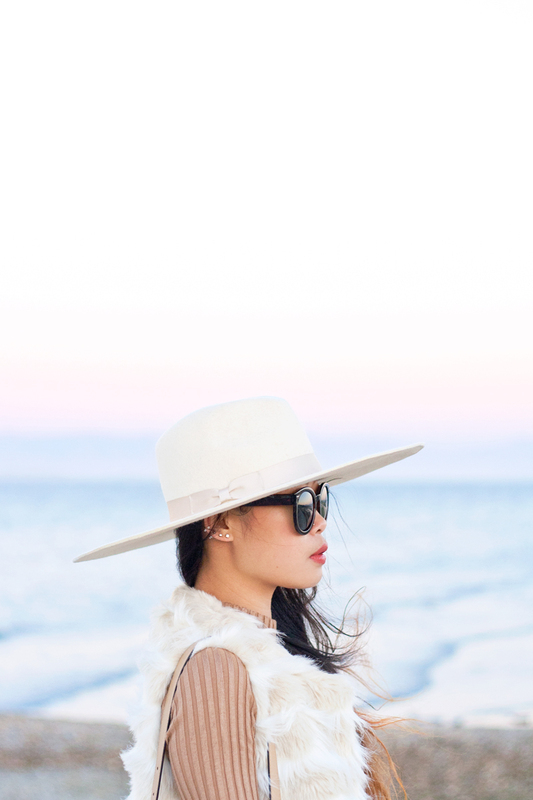 Montana wide brim fedora in ivory bone c/o Lack of Color. Triple sharktooth ring by Luv Aj.